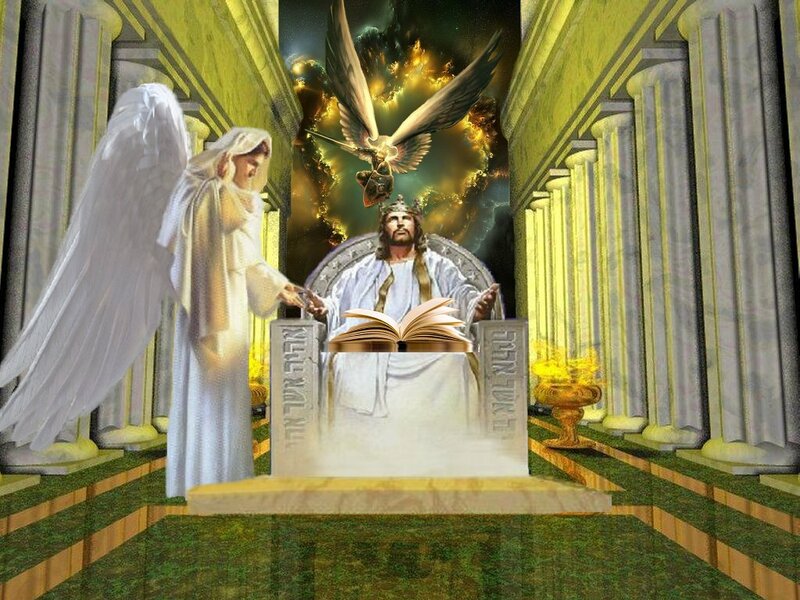 “I was in a large room, talking with several angels about the end times. We were talking about the things that were about to quickly come to pass in America and the world in general. Then I noticed a very large throne, with the LORD sitting on it beckoning me to come closer. I saw Him holding a big book in his lap. As I approached Him, I kept looking at Him and the book He was holding. I was not afraid and I felt a great wonderful peace, but somehow I was apprehensive at what I was going to see written inside the book. When I got real close to Him, He looked down at the book He was holding, as if telling me to look inside the book. I leaned forward to look inside the book, and I saw the page where the book was opened to. At the bottom of the book, I saw a sentence written: ‘THE END OF TIMES’. Right next to it, I clearly saw dates written. Interpretation: Because of the nature of what this vision contains, I have kept it close to me for the last several years without revealing it to anyone. However, I believe that the time to release it has arrived because those dates are upon us. We do not believe in setting dates and have never done so. We know that Jesus said that no one knows the day or the hour of His return. However, He did command us to watch and be sober as that day approaches. The date shown to me has to do with the times of great tribulation spoken of by the prophets of old and the Lord Jesus Christ Himself when He was on the earth. We do not believe that it has to do with the end of the world; however, it may have something to do with the end of times as we know it. We also believe after much prayer, that it may have something to do with a coming cosmic event that somehow will affect time as we have known it on planet earth. It is difficult to explain, but something will happen to the earth that will affect the fabric of space and time. The prophets of old talked about this, as well as John in the book of Revelation. These things will take place; it’s just that we never thought that they would happen in our lifetime. We believe some horrible cataclysmic event will be responsible for this. This was confirmed to me three months later in the Pole Shift Vision. and I heard a voice from heaven saying unto me, Seal up those things which the seven thunders uttered, and write them not. And the angel whom I saw stand upon the sea and upon the earth lifted up his hand to heaven, And swore by him who lives forever and ever, who created heaven, and the things that are therein, and the earth, and the things that are therein, and the sea, and the things which are therein, that there should be time no longer."